Cars no longer differ from country to country, but once they had definite national characteristics. What happened when two nations met – collaboration, collision or confusion? We now seem to have reached a consensus that the type of car most should be is ‘Germanic’, being lazy shorthand for something efficient, hard riding, fast enough and, usually, a bit clinical. Some sports cars remain, possibly, more traditionally ‘Italianate’ in spirit, being nervy, noisy and involving to drive. Nowadays, though, car making is truly a global industry where an Italian car maker might produce a model exclusively in Poland, and where the designers and engineers come from scores of different nations. Nearly fifty years ago this wasn’t the case. American manufacturers found that they couldn’t build 66% scale models of their domestic products and expect to sell them in Europe – from time to time they tried but learnt the lesson. Equally, German makers didn’t really expect their more austere offerings to be that popular in France, where a car was expected to be a bit more cosseting. And if it was sportiness you wanted, no-one really expected to tell the Italians what to do. So Citroën’s takeover of Maserati in 1968 seemed, at first, an odd thing. Citroëns were quite complex devices, with development led by engineers and aimed at a wide range of society. Maseratis were only made for a wealthy elite and, below their exotic skins, were often quite crude. What Maserati were very good at were engines, an area where Citroën generally underwhelmed – the 4 cylinder in the 1968 DS could trace its origins back 34 years to the Traction Avant. There were two reasons for the acquisition in the mind of the then Citroën President Pierre Bercot. First was the desire to get a well-designed, six cylinder engine for a proposed flagship GT car and for the DS or its replacement. Second was the fact that he felt an enormous affinity towards the Italian firm. 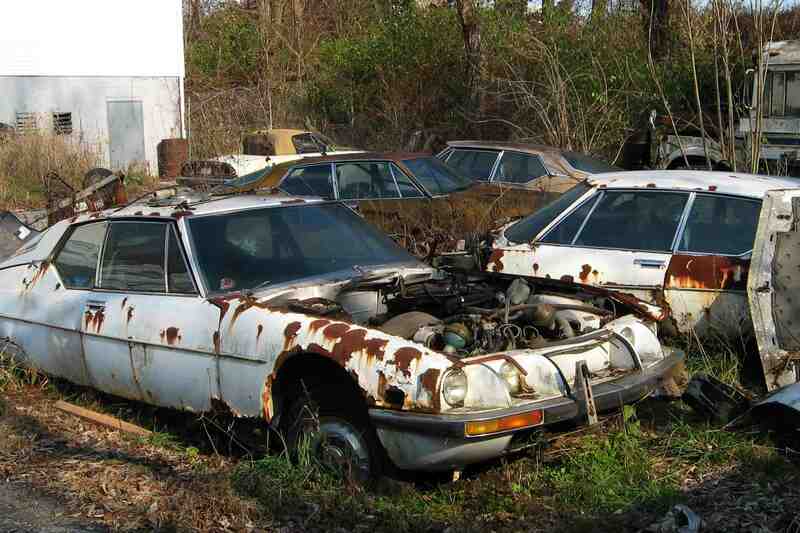 There were factions at Citroën who thought this a bad idea, but he prevailed. Ing. Giulio Alfieri had worked for Maserati since 1953. He was brilliant but he could be difficult to work with and was known to be reluctant to delegate responsibility for design work, wanting to be involved in all areas. He also had an initial, though unfounded, hope that Bercot would appoint him to run Maserati. His first project was to produce the six cylinder. This had to be compact, to allow for a front/mid layout, with the gearbox and front wheels well ahead. A V6 was chosen and, to keep it as low as possible, a 90 degree angle instead of the optimal 60 degrees. To sell the idea to Citroën, he produced a prototype in just one month by converting an existing V8 block. This certainly impressed, but then he went back to a clean sheet and designed the actual V6 that ended up in the SM, a remarkably compact and lightweight motor. Both because he spread himself over so many projects, and because of a tendency to overconfidence bordering on egotism, Alfieri didn’t acknowledge a potential problem with the timing chain tensioner, resulting in the well-reported failures in the SM’s early life. The actual fix was straightforward but, as is so often the case, the damage done to the engine’s reputation lasts to this day. In fact it is an excellent unit, remarkably tractable and reliable and devoid of significant foibles, especially in injection form. As for the car that Citroën produced to take this engine, the SM’s character is endearingly (or infuriatingly if you look at it differently) both French and Italian. It combines the softness of ride and comfort you’d expect, with the rasp of Alfieri’s V6. It’s a heavy car (Bercot’s original intention was for something Porsche 911 sized) and 180 bhp doesn’t electrify it. Back in 1970, acceleration at lower speeds was respectable, but now it would be seen off by quite a few mid-range hatchbacks. However, it wasn’t intended to be about that. The SM was a proper grand-routier designed to maintain high speeds safely, and at ease, all day. Good aerodynamics ensured its top speed was on a par with a contemporary 7 litre Jensen’s and, at speed on a motorway, it tracks perfectly with no lightness or twitching, something you couldn’t say for many of its contemporaries. That doesn’t make it ponderous on more challenging roads, though. It has very good roadholding, the unique steering makes it extremely accurate to position with the minimum of effort and it can be thrown about quite surprisingly, if required, though that doesn’t really suit its image. Noise from the V6 is more obvious at speed than some of its larger-engined competitors, but it is a good noise. The blending of the two car making cultures came together to make something that remains quite unique to this day, which is a positive for owners but a negative for potential owners at the time who were too impatient to get used to it on a short test drive accompanied by a dealer who was used to selling 2CVs and DSs. Back at Maserati what was happening? This was not like Citroën’s takeover of Panhard from a few years earlier where, having acquired useful factory space, production of Panhard cars ceased within two years. Citroën, or more correctly Bercot, wanted Maserati to thrive. With this in mind, he appointed just four Frenchmen to move down to Modena to work at the factory and their job was to work for Maserati, not Citroën. There was to be no external interference from Citroën, save a desire for the fitting of more ancillary items such as alternators from French companies. The only real changes made were positive – investment, recruiting, better facilities and the introduction of the same, more generous, working practices used at other Citroën factories. Not being appointed to the top job, it might have been assumed that Alfieri would have been very antagonistic towards his new bosses but this wasn’t ultimately the case. He started looking at the new models that were to replace such as the Ghibli, Sebring and the first Quattroporte and to imagine what he could do if the technology flow went in the other direction. Without any pressure from Citroën, he became very enthusiastic about the idea of incorporating Citroën hydraulic engineering into new Maseratis. The mid-engined models were drawn by Giorgetto Giugiaro at the height of his abilities. The V8 Bora used high pressure hydraulics for the brakes, and even to adjust the control pedals and seat height. Its small brother, the Merak, was an expedient money maker, using the SM’s V6 in 3 litre form in a variant of the Bora bodyshell. But the most interesting hybrid of all was the effective Ghibli replacement, the front-engined Khamsin, that also incorporated Citroën’s radical DIRAVI steering. The exterior of the Khamsin was by Marcello Gandini who, again, was possibly at his most creative. There are hints of his earlier Lamborghini Espada there but it was a very elegant coupe, unless you lived in the USA where federal bumpers disfigured it beyond belief. Old school sports car people were understandably sceptical about combining technology from soft riding French saloon cars, but Maseratis had always been somewhat more civilised than comparable Ferraris and it was a good marriage. But by then it had all gone wrong. Throughout the Sixties, Citroën were aware of the huge gap between the Ami and the DS in their range. 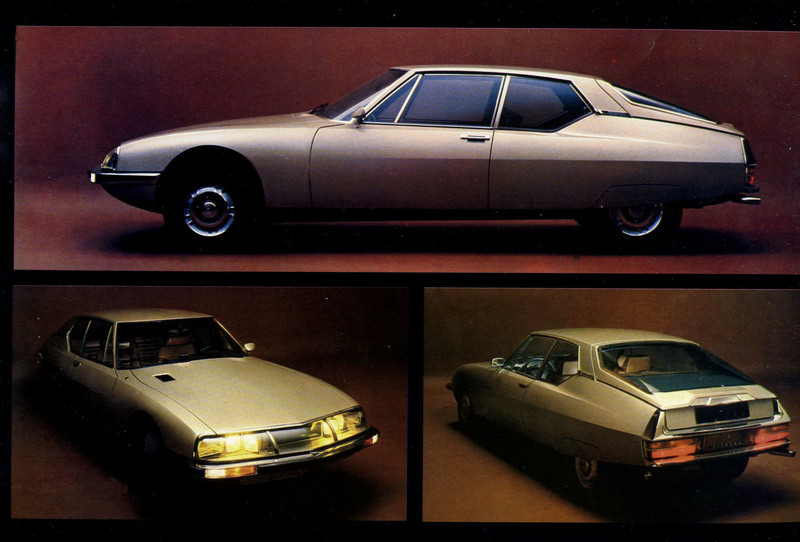 The A Series cars made good profits, but the DS was expensive to produce, and a mid-sized model was needed. Two projects were instigated to fill this need, C-60 then Projet F, and both were abandoned after huge expense. The factions in Citroën against both the SM and the Maserati takeover felt that they were just a huge indulgence and that Projet G, which eventually became the GS, as well as the longer term replacement of the DS were the things that really mattered. History proved them right. The GS that finally arrived in 1970 was an excellent car, as was the CX when it appeared in 1974 but, combined with the failed Comotor Wankel engine project with NSU, the cost of the Maserati investment and the effect of the 1973 oil crisis, Citroën had overstretched themselves massively. A possible partnership with Fiat came to nothing, so owner Michelin, who had usually employed the same hands-off approach to Citroën as Citroën had to Maserati, finally conceded and Peugeot took control in mid-1974. At the time, Peugeot was an admirable company making excellent, but conservative, cars. However, its philosophies were very different and it couldn’t divest itself of Maserati and shut down SM production fast enough. The economic situation of the time will have played a part, but you can’t help but feel that, despite its long relationship with Pininfarina, Peugeot would never have been have been happy with a wayward and highly-strung Italian offshoot. One of the first things Alejandro De Tomaso did on taking over Maserati in 1975 was to sack Alfieri. 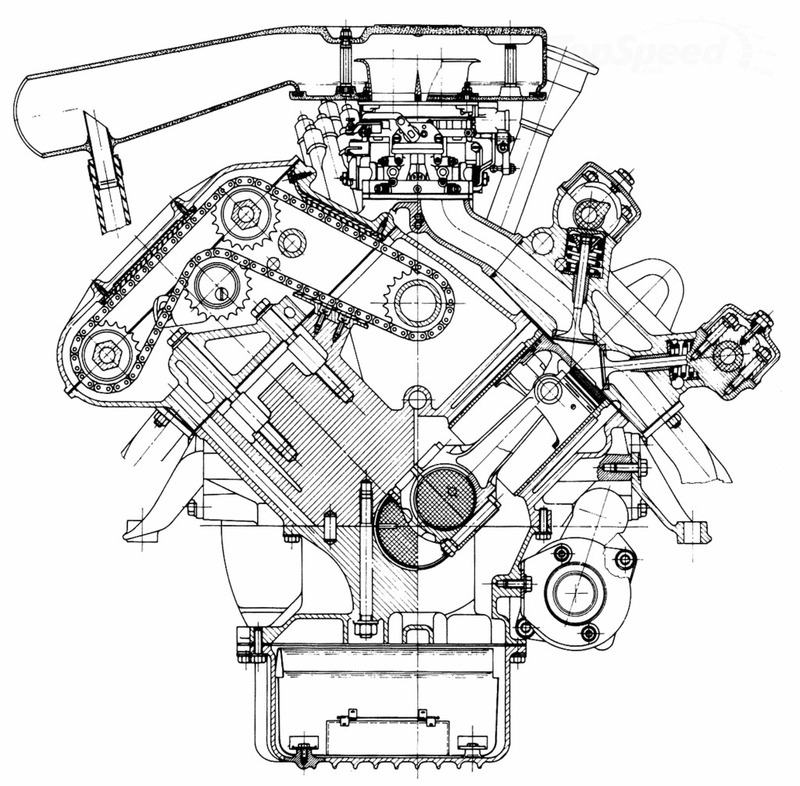 The concept of a small 90 degree V6 he kept for the new engine for the Biturbo, but he de-Citroënised the then-current range as much as possible. This is regrettable but, from the point of view of a pragmatic survivor like De Tomaso, understandable, and he kept the company going through difficult times. It’s unlikely that anyone else would but, in that period, the company’s reputation undoubtedly suffered and, in the often superficial world of exotic car collectors, the image of classic Maseratis suffered accordingly. For many years, in the classic world, Maserati lived in the shadow of Ferrari. As collectors fell over themselves to get hold of anything with a Prancing Horse, even wonders such as the 3500GT went for inexplicably low figures in comparison. Possibly fuelled by the marque’s resurgence this century, making the badge better known, Maserati values have risen massively but, comparing the price of a Khamsin with a Ferrari 365GTB Daytona, or even its often overlooked 365 GTC/4 sibling, it is still very underappreciated and, in the minds of some of the less open-minded marque enthusiasts, the Citroën cars are tainted. But these were the first Italian production sports cars that broke away from the garagiste attitude summed up by Enzo’s supposed quote that he sold you the engine and the rest of the car was free and, had circumstances not contrived in the way they did, they would be seen as landmarks. In hindsight, The whole Maserati exercise can be seen, just as many inside Citroën saw it at the time, as Pierre Bercot’s vanity project. It produced some great cars, and probably the Maserati name wouldn’t exist today otherwise. However, if I consider an alternative history for Citroën where they weren’t forced into Peugeot’s possibly well-meaning but penny-pinching hands and, instead, today we could buy the true successors to the 2CV, GS and CX, wouldn’t that have been preferable? The most comprehensive reference of this time is the excellent book “Maserati – The Citroën Years 1968 – 1975” by Marc Sonnery. To my eyes, Maseratis of this period are prettier by far than their Ferrari contemporaries. A contentious statement, I know, and certainly not one the classic car market would agree with. No contention from me Chris. I realise that market value is a crass judgement of a car, since many ‘collectors’ have no actual historical, technical or aesthetic interest in their investments, beyond the badge. However on mobile.de today. Khamsins are going from €135,000. Boras from €175,000. Ferrari 512BBs from €335,000 (‘not roadworthy’) and there’s a bargain Daytona at €689,000. Personally, I’d take both the Maseratis over the Ferraris, and that’s not just because a Ferrari comes with too much social baggage these days. I’m really regretting that I didn’t buy the Khamsin I saw at Beaulieu Autojumble 20 years ago which I could probably have got for a few thousand. I seem to remember the interior was blue velour. The outside was White, Dulux Gloss possibly, applied by brush, not roller. Sean. Thanks for this enjoyable article about the wonderful connection that brought us a row of great cars on both sides of the Alps. It’s a pity I’ve not yet had the pleasure to drive any of those. The failed partnership with Fiat that you mention was not entirely without result. However, it was on the sector of commercial vehicles and seems to be widely unknown outside Italy, France, and maybe Switzerland. The Fiat 242 / Citroën C35 was a really outstanding van for its time (starting in 1973 or 1974, depending on sources). It featured four disc brakes and independent suspension on all wheels which gave it an astonishing ride both empty and fully loaded. I have driven a C35 on many occasions and have never felt that safe in any van afterwards. I used to take curves with speeds I’d have resisted in my AX I drove at that time. That was pure fun, but also a necessity, as with its 60 hp petrol engine, you’d always be careful not to lose any momentum. But if you still had to lose it for some reason – the hydraulic high-pressure brakes from Citroën found their way also into this vehicle, and they made sure you brought it to a safe halt at any weight and speed. And even down Alpine passes without fading (which could not be said of a Renault Master I once had to drive). Simon. Yes, indeed, I could have mentioned that the Fiat connection was not a complete dead end. Particularly as I have a second generation Ducato motorhome which is also surprisingly nimble and good handling (though helped by an Alko chassis) on Alpine roads. It reminds me that the first generation Sevel vans were available badged as Alfa Romeos – with my preconceptions it amused me to see Alfa F12 vans when I first drove in Italy, especially when I learnt they had twin cam engines. The Khamsin and SM are gorgeous, more so in the flesh than pictures. Their side profiles have a certain elegance to them. If only I’d had the money when they were so cheap…. And the worst thing is that values have only gone up relatively recently.